Once it becomes apparent Bolingbroke's coup will succeed in deposing him and his belief that god will keep him on the throne proves false, Richard turns from smug youth to petulant teenager, surrendering the crown without a fight but with a lot of tantrums instead. 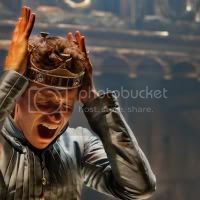 Andrew Buchan provides a great contrast as the gruff, businesslike warrior Bolingbroke, while Ron Cook as York gets a more rewarding role after his rather neglected Fool in last year's King Lear. Pippa Bennett-Warner is also memorable as Queen Isabel, one of the few people whose affection for Richard turns out to be genuine after he's dethroned, and Michael Hadley as John of Gaunt does justice to the play's most famous speech. But the cast is hard to fault all round. Richard Kent has designed an impressive Byzantine set - apparently a protégé of Christopher Oram's, he accordingly gives us some high arched doorways against the back wall. Grandage's production is less flashy than the decor, rather thoughtful but no less engaging for that - Andy said afterwards he'd enjoyed it a lot more than he usually does the Histories. In one scene Bolingbroke, by now Henry IV, makes a passing reference to his wayward son and the bad company he keeps in London's taverns. I wondered if the plays had been written out of order and this was an in-joke to remind the groundlings of their beloved Falstaff, but apparently no, Richard II does slightly predate the Henry IV plays. So it seems as well as writing plays, Shakespeare also invented the teaser for coming attractions. Richard II by William Shakespeare is booking until the 4th of February at the Donmar Warehouse.